From left to right in front are Brynna Dodrill, Cassie Puckett, Maggie Simmons, Havanah Grube. From left to right in back are Sarah Meucci, Nichole Dodrill, Shellie Puckett, Jennifer Robertson. Girl Scout Troop 201 donates blankets to the Bright Beginnings Unit at Pleasant Valley Hospital. 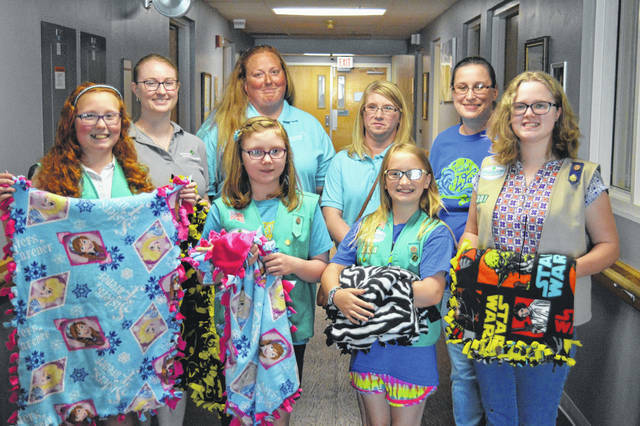 POINT PLEASANT — Gallia Girl Scout Troop 201 donated seven blankets to the Bright Beginnings unit of Pleasant Valley Hospital Wednesday afternoon as part of the last step of a service project and the earning of a new badge. Third through seventh grade scouts, to assist with the third grade Brownies, worked on a “journey” that consists of a series of steps for a larger badge which is capped by a community action service project, said Girl Scout Troop Leader Sarah Meucci. The community service project needs to identify an area of need in the community and a way to continue meeting that need. “Our plan is that our troop is going to continue donating blankets to meet the needs of the Bright Beginnings unit,” said Meucci. According to pvalley.org, the Pleasant Valley Hospital Bright Beginnings Unit attempts to create “bright and healthy” futures for babies born with Neonatal Abstinence Syndrome (NAS). With specially trained nurses, 24-hour monitoring and the latest eqiupment the unit provides specialized treatment and care for children born of addiction to help them through withdrawal process before they are taken to a neonatal intensive care unit. “Babies born with NAS receive structured medical care in the Bright Beginnings Unit to wean them off of their chemical addiction gradually and safely. Because they are highly susceptible to overstimulation and “failure to thrive,” the babies are cared for in a soothing, low-stimulation environment, with the help of volunteer “cuddlers” who have been trained in therapeutic ways to hold and feed the babies,” the site says. “It felt good giving the babies blankets so they would feel better and be more comfortable,” said Cassie Puckett of the troop.